Remember the days when you would take pictures at a special event? We would have to wait a week or so to get the photos developed. My how times have changed! If you do remember those times, then there’s a good chance you have some boxes of physical pictures taking up space in your home. If this sounds familiar, then today’s post is for you! I’ll be talking about how to digitize those old pictures, and how to manage your digital photos going forward. 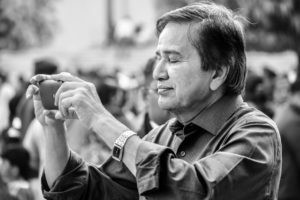 It can’t be denied that photos are a wonderful way to evoke memories of times past and loved ones that are no longer with us. For that reason, it can be especially difficult to declutter photos. We fear throwing away some part of our past we’ll otherwise forget. With a little discipline and time however, it should be straightforward to get on top of both those old physical photos as well as the multitude of digital photos we may already have. 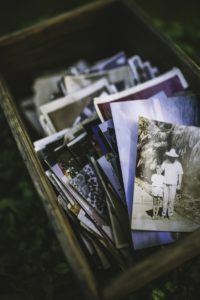 If you do have a collection of old printed photos or slides, they’re probably sitting in a box, gathering dust and taking up space. Perhaps they aren’t organized, or maybe they’re in albums that are so large and heavy, it’s not even easy to pick them up and look through them. 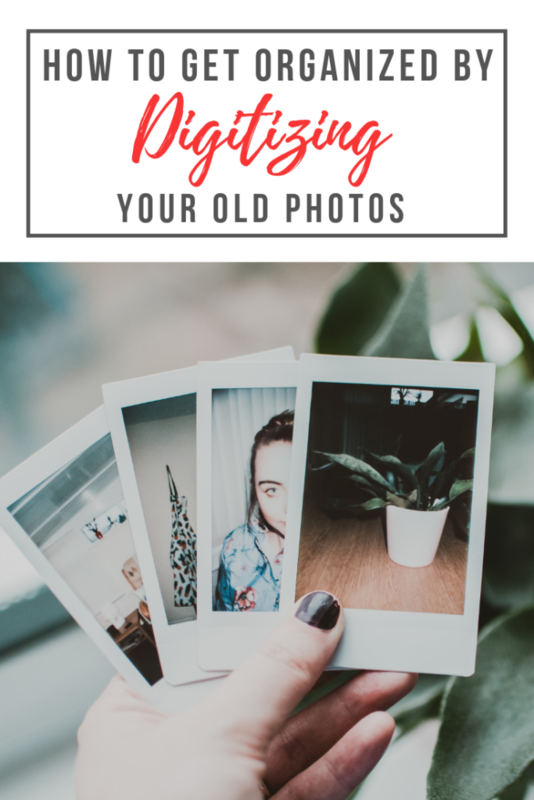 If this is the case for you, and if you are looking to maximize space in your home or downsizing, then getting your pictures digitized makes great sense. While there are tools that allow you to digitize photos yourself, the easiest way is to take them to a professional who can complete this for you. If you don’t have a local company who can digitize photos, slides and videos, then there are online companies who can also do this for you. Do I know everybody in this picture? Do I have multiples of this picture? Is the picture good quality or is it blurred? You can also implement ‘the 2 second rule’. Rather than stopping to reminisce over each photo that you look at, give yourself just 2 seconds to look at each photo. Decide whether it’s a keeper, or can be let go. The end result of all your hard work will be a tiny thumb drive with all your pictures on – amazing isn’t it? Pro Tip: if these pictures are precious to you, consider making a back-up of them. That means creating at least one or more copies that you keep in different locations. That might include another hard drive, or using cloud back-up services. Now that you’re fully digital, it’s important that you keep your digital life organized too. It’s wonderful that we can take so many pictures with our cell phones these days. The downside is that we take many more photos so we can get the shot just right. These tools help you manage your photos in all sorts of clever ways. 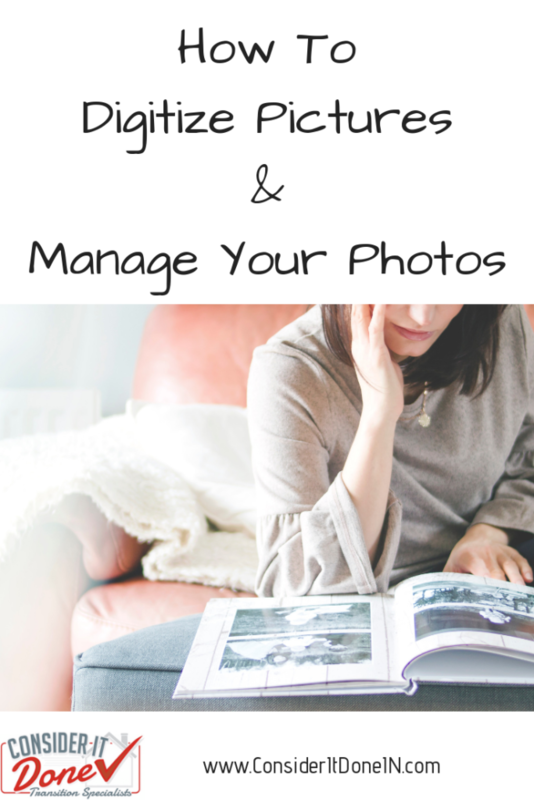 They offer easy ways to organize your pictures into folders. They also offer you the ability to share them with your friends and loved ones. Digital cameras and phones have the ability to detect the date, time and location where your pictures were taken. 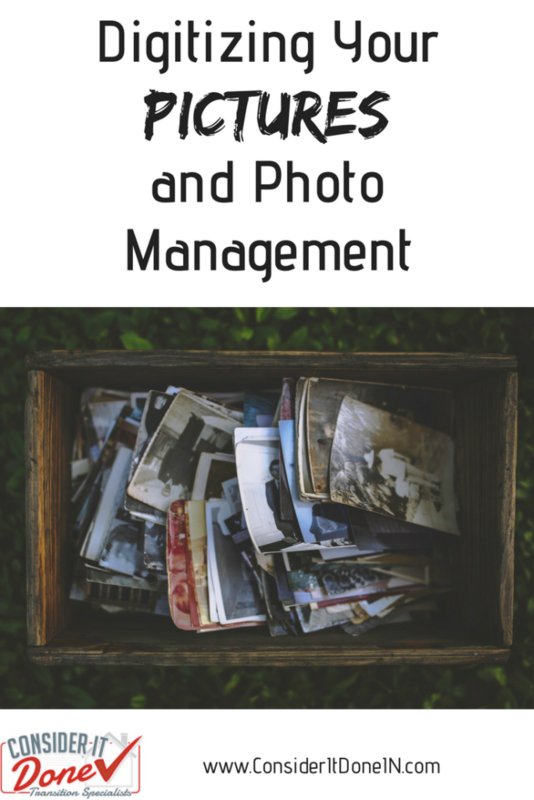 Photo management tools use this information to organize your photos for you. They are also clever enough to detect duplicates in your pictures and delete the 11 copies you don’t need. So there you have it. Some of my tips on reclaiming space from all those old pictures you have in your home, and keeping on top of your digital photos too. Don’t forget to sign up for my newsletter for more helpful tips from Consider It Done!